Hello everyone- sorry I’ve been a bit quiet on here recently! I’m very busy setting up a new website to replace this and my current site which is very exciting! Please be patient and all will be revealed soon! I am also currently planning the next Fairy Tale Fair which is Saturday the 9th March in Brighton, all details here. I will do a post about this soon as well. 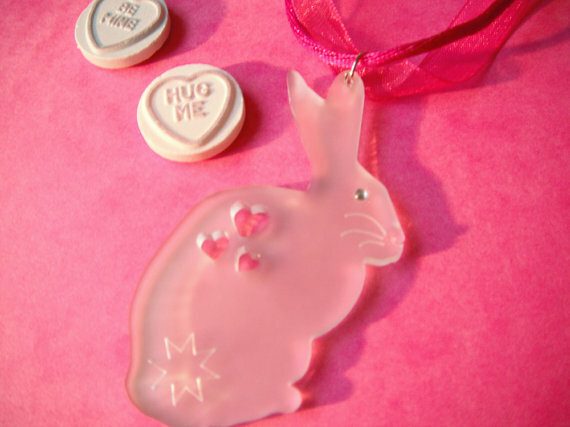 Also not long until Valentine’s day- see my Etsy shop for lots of cute gift ideas! Hope you all had a fab Christmas and New Year! I have been busy finally setting up my Etsy shop! 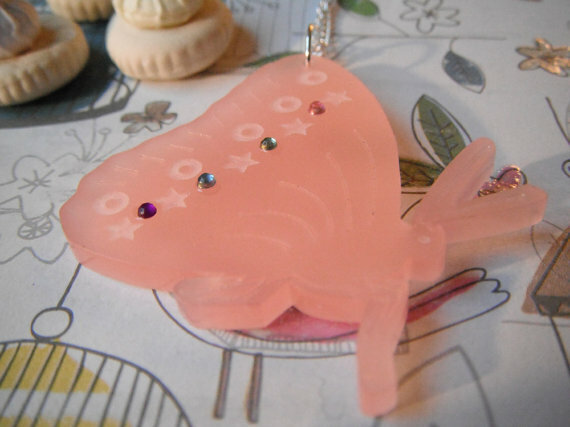 You can now buy my jewellery, cards and bags online, which is very exciting! More items are being added each week, so keep checking back! And as a launch special there is 10% OFF EVERYTHING! But be quick it is on for one week only!! It is also the launch of my new brand name Cat-a-Cake Creations (I hope you all like it)! Why not spend your Christmas money on something handmade this year, or buy yourself a New Year treat! 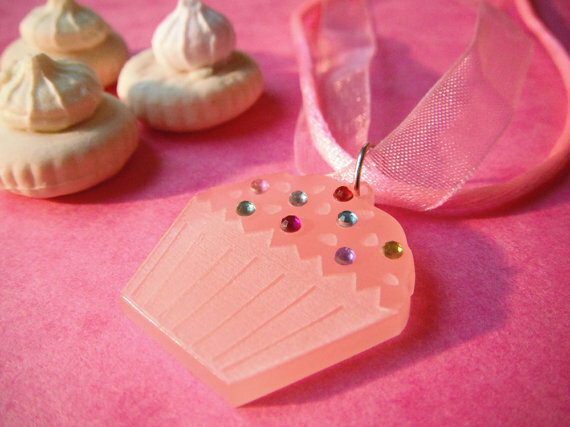 It would be lovely if you could have a look: Cat-a-Cake Creations Etsy Shop. My tree- full of sparkle and pretty things! Ceramic Snowman, kindly sent as a gift from Flossy Teacake. Polymer Clay bird by Clair Letton, of the Cake House. My wooden tree decoration and a hand made fairtrade basket bought at a charity fair. Peg doll by Trish Palmer, bought at The Fairy Tale Fair. Patterned handmade ceramic heart, bought at Makers Boutique, Brighton. Polymer Clay handmade heart by Clair Letton of The Cake House. Happy Christmas everyone- hope you all have a super time! Hope there is lots of handmade, crafty gift giving also! Can’t wait for more fairs and new ranges in 2013- thanks to all those that have supported, visited and purchased during 2012- it really means a lot! 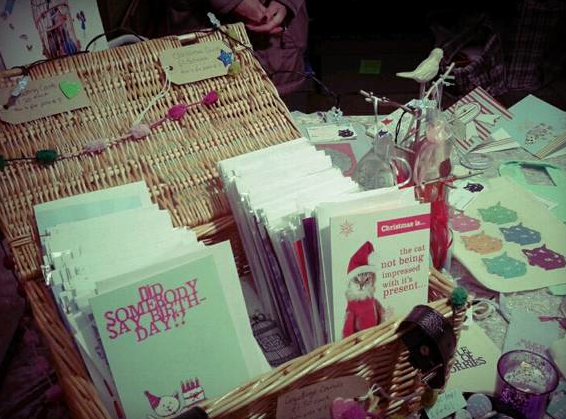 Here are a few photos from the Christmas Market at The Brighton Centre yesterday. It was a fab event organised by Kelly of Belle’s Events. 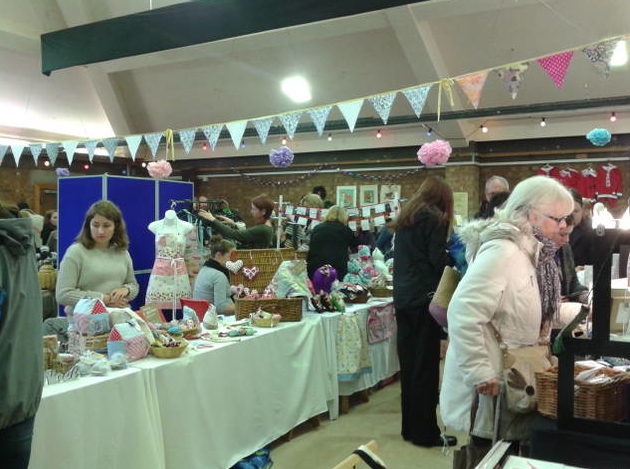 It had a nice range of stalls including crafts, jewellery, yummy cakes, beauty and more. 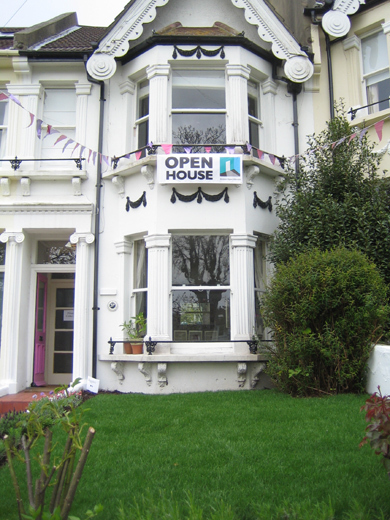 There was also live singers all day including Brighton Rock choir who were super! 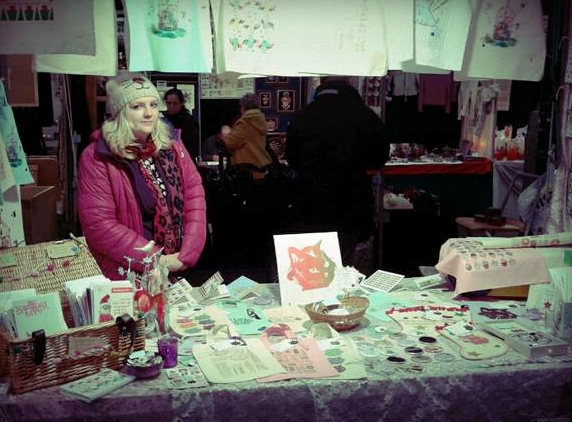 This was my last fair for Christmas 2012, so thanks to those who came along. 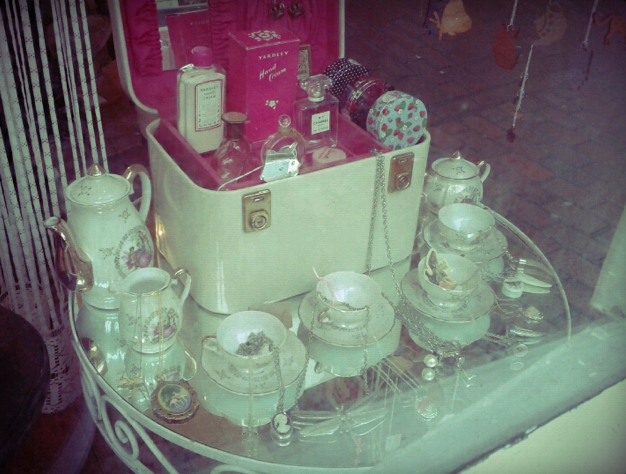 Super yummy & pretty cakes! Lots of festive gifts off to new homes! 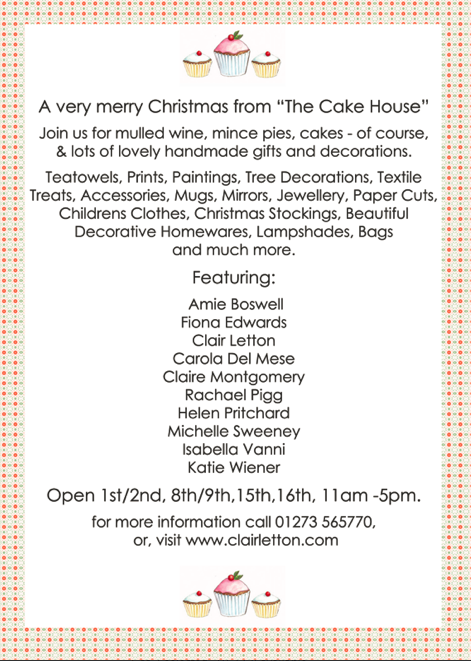 Although this market was my last event of the year, I am also in The Cake House open house today (37 Cleveland Road, Fiveways, Brighton). We are open until 5pm and it is the last day so don’t miss out on this final opportunity to get some wonderful handmade gifts! 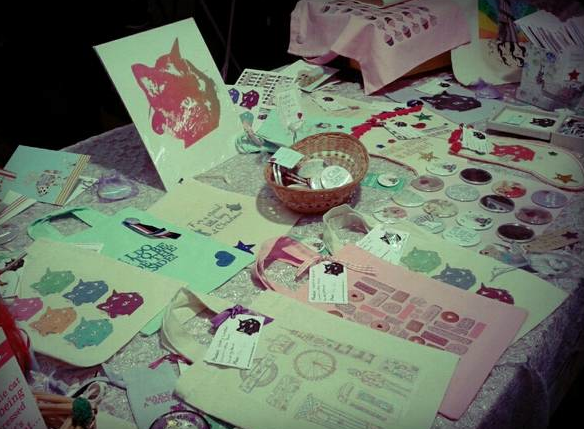 I had a lovely day yesterday selling at the Brighton Craftaganza. This event always has such a nice atmosphere- particularly at Christmas! There was such wonderful handmade gifts to be found at the fair, and visitors certainly seemed impressed with the quality of work! Sarah from the wonderful Shark Alley busy making her otters! Competition Time- Win Daisy the Deer! The Fairy Tale Fair Facebook Competition is only on for one more week! 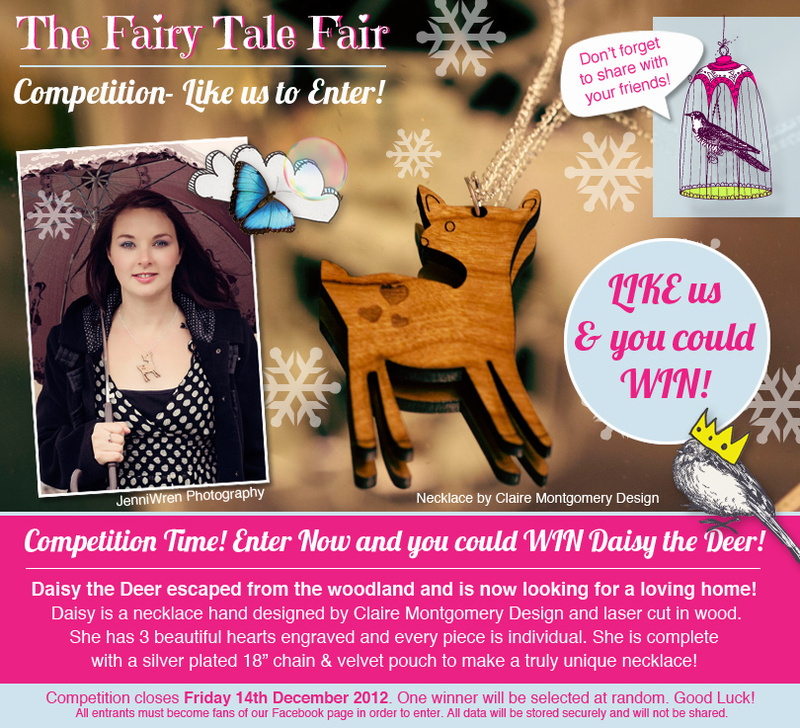 Don’t miss this opportunity to enter and win a special hand designed Daisy the Deer necklace handmade by myself. 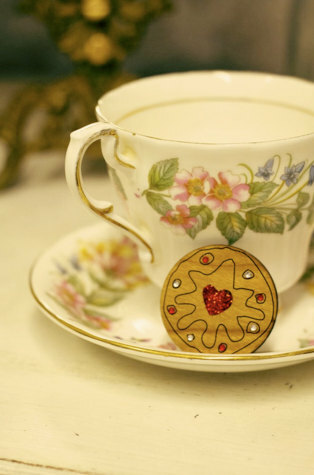 She is laser cut in a cherry wood veneer and has three beautiful hearts engraved. To enter simply head over to The Fairy Tale Fair’s Facebook page now and LIKE our page, and comment/ tag yourself on our post about the competition at the top of the page so we can keep track of you! You can also enter by entering your email here. Good luck- competition closes next Friday! 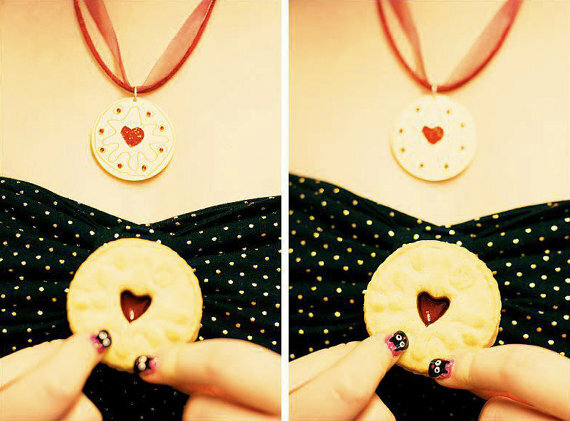 Here are some photos of my laser cut brooches, which are available now. 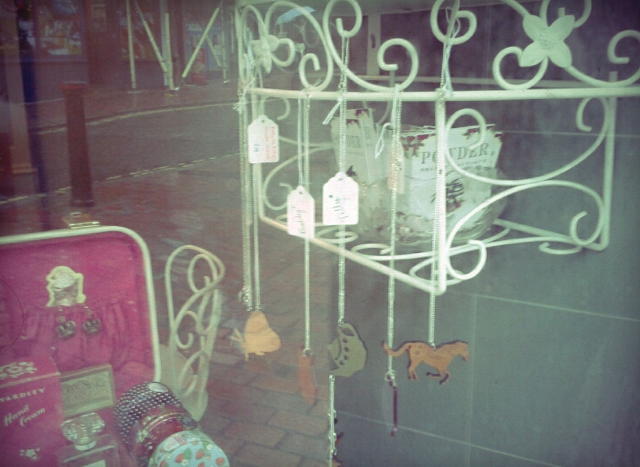 They are all hand designed by me and laser cut locally in Brighton. They are then hand finished. They are made from acrylic or wood and available in various designs including Buddy the Cat, Hayley the Horse and Rosie the Robin. These brooches are available now and will be on sale next Saturday the 8th December at Craftaganza (Duke Street, central Brighton). Some designs are also available at both artists houses I am part of, and also on Saturday the 15th December at Belle’s Christmas Market, The Brighton Centre. There is just one available of each so don’t delay! You can also email me at sayhello@clairemontgomerydesign.com to order one! 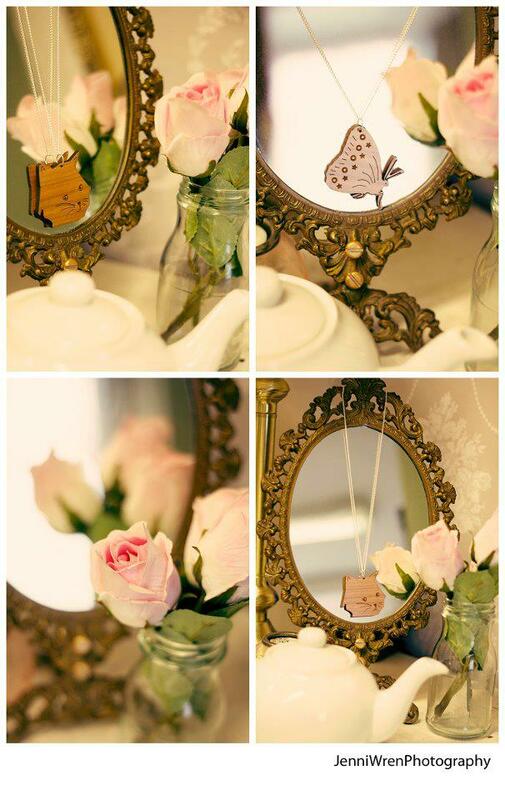 Rosie the Robin wooden necklace and earring set, boxed: £15. Laser cut, hand designed and finished. Available now! Laser cut, hand finished tree decorations with diamontees. Frosted acrylic and wood. £5 each! Available now! 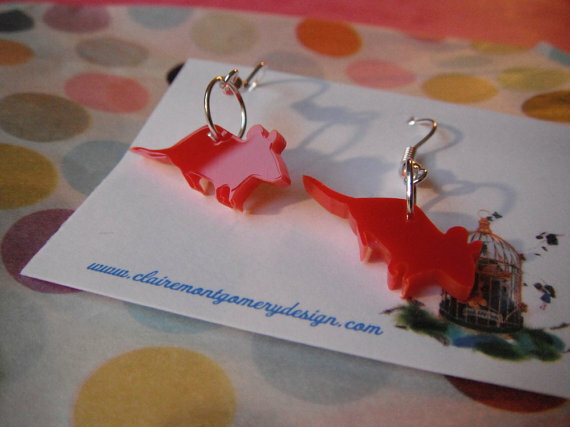 Hand designed, laser cut earrings. 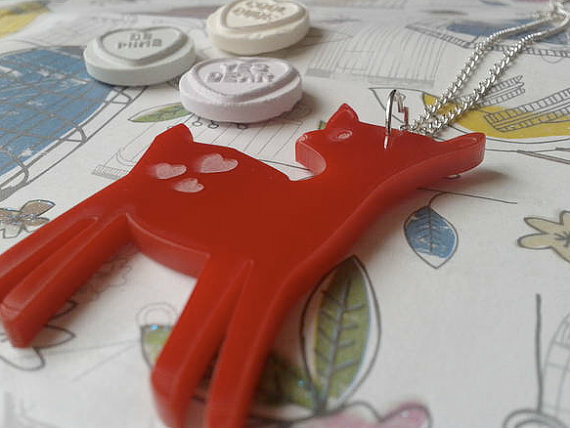 Several designs and colours available including deers, robins, cats, dogs, mice, horses, penguins, birds and more! Silver plated findings. Available now but designs selling fast! 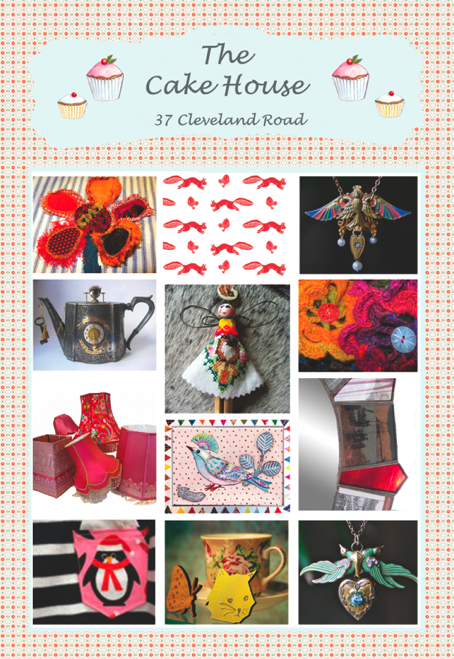 Just to let you all know I will be taking part in the Makers Boutique this Saturday in New Road Brighton. It is open 11am-5pm and is conveniently located in central town. 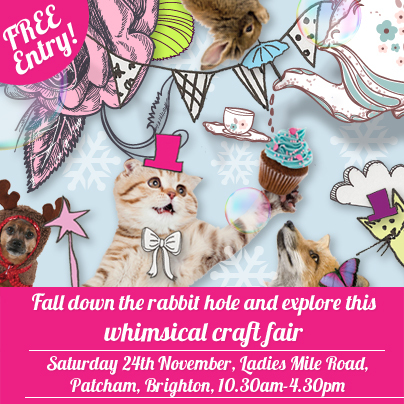 Makers Boutique is Brighton’s most popular regular craft market and don’t miss this months festive special! 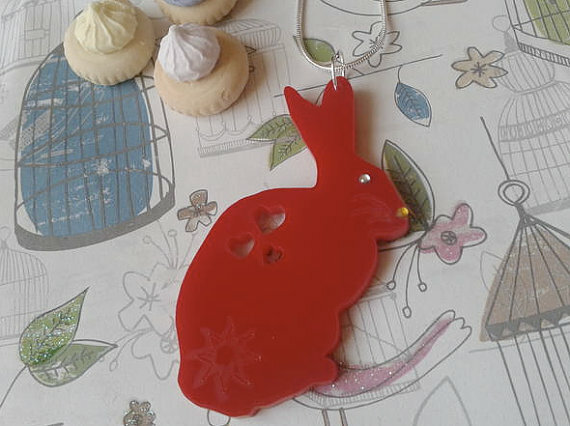 I will be selling a range of my laser cut jewellery including my winter range of animals. 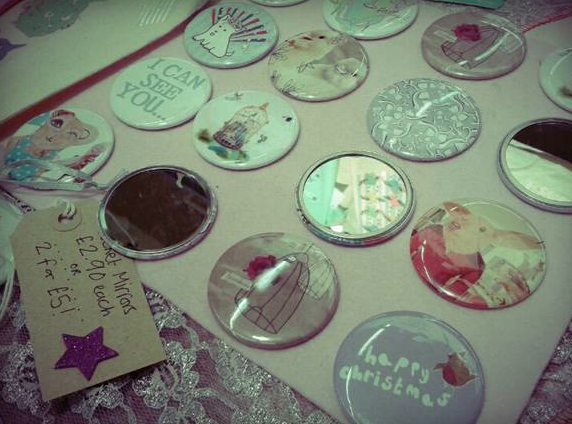 Also I will be selling Christmas cards, cotton bags, pocket mirrors, badges and more! 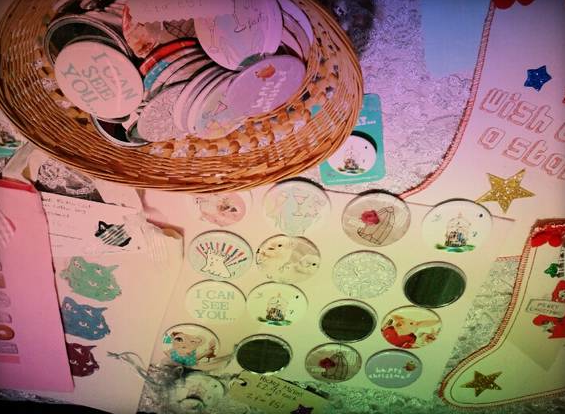 Our day at The Fairy Tale Fair- more pics soon! 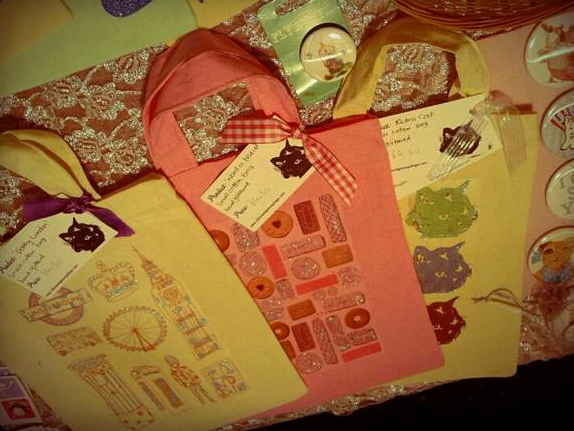 Here are a few photos of my stall at Covent Garden. The stall holders there were lovely and welcoming. Unfortunately the weather meant it was a quiet day but it was a good experience all the same and I am pleased I have been accepted into such a prestigious venue. 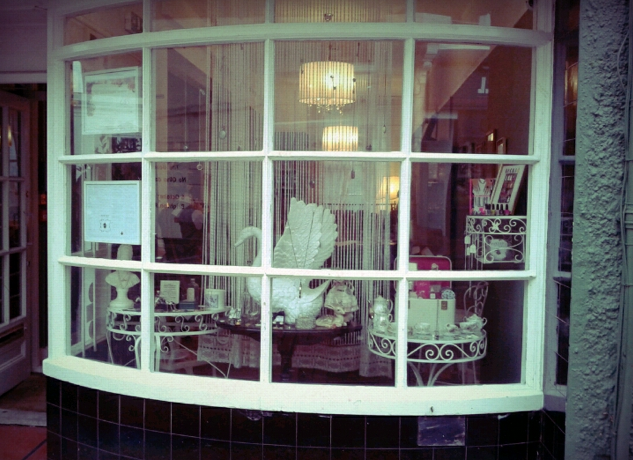 A few photos of my jewellery in the window of Powder Beauty, Brighton. 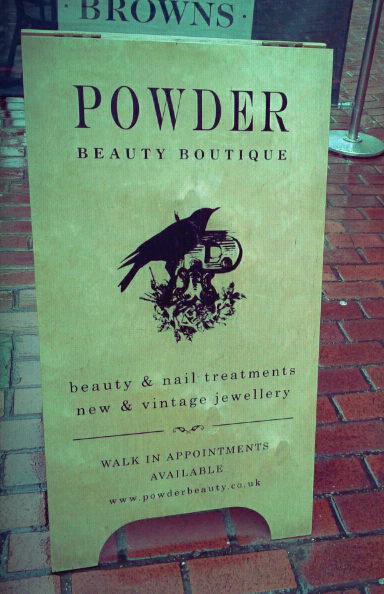 Powder is a beautiful, vintage inspired beauty salon in the prestigious lanes Brighton (Duke Street). 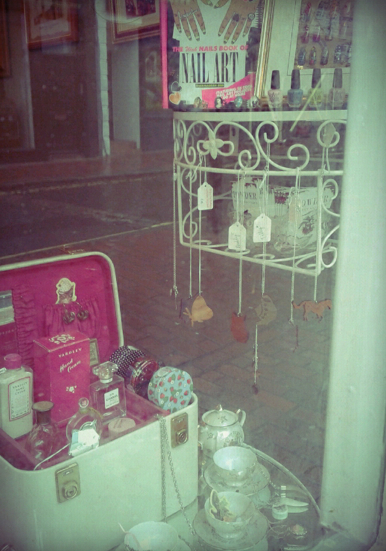 Many of my necklaces are available there now including Buddy the cat, Betty the Butterfly and Tilly the Teapot. You can also find a selection of my cards and mini badges inside! They will also be joining us for The Fairy Tale Fair on Saturday 24th November!